8.1 Does the PoP Miner require BTC or tBTC? 8.2 How can I see my PoP rewards? 8.3 Do I need to run a full Bitcoin node? 8.4 Does the Bitcoin I send to my PoP Wallet need to be confirmed? 8.5 How do I set the BTC transaction fee? 8.7 How to auto-mine every Nth round? 8.8 Can I run multiple PoP Miners? 8.9 Can I import a previous BTC wallet? 9.3 Mining operation action took longer than expected. Operation can be resubmitted. 9.4 Why does the BTC address change each time I run the showAddress command? The Proof-of-Proof (PoP) consensus protocol enables a security inheriting blockchain (VeriBlock) to inherit the complete proof-of-work of a security providing blockchain (Bitcoin). For a deeper understanding of the PoP consensus protocol, please refer to the PoP White Paper. A PoP miner serves as the communication and transactional bridge between the VeriBlock blockchain and the Bitcoin blockchain. As often as they wish, a PoP miner will take the most recent blockchain state data from the VeriBlock blockchain, along with an identification of the miner, and publish it to the Bitcoin blockchain via a transaction containing an OP_RETURN with the embedded data. The PoP miner then waits for the transaction to be included in a Bitcoin block. When a publication transactions is confirmed, the miner constructs and submits a "proof-of-proof transaction" that proves inclusion of the publication in the Bitcoin blockchain as well as ownership of the publication. PoP mining is a competitive endeavor in which miners compete to have their endorsement of the VeriBlock blockchain state included in the earliest possible Bitcoin block. Download the latest NodeCore software suite from the VeriBlock Github repository and extract the contents of the package. Follow the instructions at NodeCore QuickStart to start a local instance of NodeCore. For PoP mining to be successful, the local NodeCore instance must be fully synced with the VeriBlock network. On first execution of the application, you will be notified that the application creates a lightweight Bitcoin wallet and that you will be shown a set of "seed words" that can be used to recover your wallet later on. Acknowledge this by typing 'y' and pressing ENTER. Acknowledge again that you have seen the seed words by typing 'y' and pressing ENTER. The PoP miner acts as an SPV client of the Bitcoin network to maintain the internal wallet. 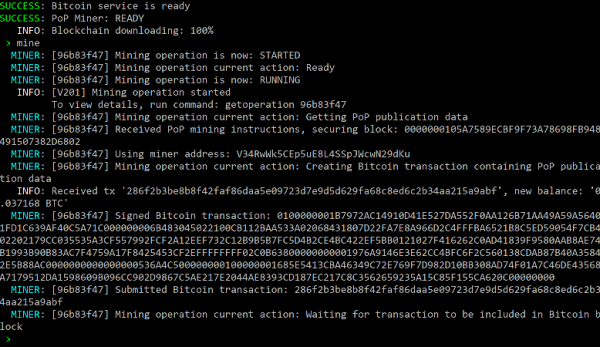 On the first run of the PoP miner, the Bitcoin blockchain will be downloaded (this is nearly all just block headers and not full blocks). Congratulations! You are ready to start mining! The PoP Miner is pre-configured with a default value for the transaction fee to use when creating Bitcoin transactions. It is expressed in satoshis per KB (1000 bytes) and defaults to 20,000. It is highly recommended that you assess the current Bitcoin transaction fee market and configure the miner with an appropriately competitive transaction fee. Additional insight regarding transaction fees can be found in the FAQ section below, under the question "How do I set the BTC transaction fee?" A mining operation is variable in the amount of time that it takes to reach completion. The first several steps of getting publication data and submitting a Bitcoin transaction happen very quickly. You then have a period of waiting while that transaction waits to be confirmed in a Bitcoin block. Assuming your transaction fee is competitive enough to be included in the next block, you are waiting for that next Bitcoin block to be mined (on average, once every 10 minutes, though much longer times are not uncommon). Once the transaction confirms, you'll again have a rapid sequence of steps in which your transaction is proven to exist in the Bitcoin block and the proof-of-proof transaction is submitted to the VeriBlock blockchain. At this point, the miner continues to listen as new Bitcoin blocks arrive and in the event a Bitcoin blockchain reorganization causes your endorsement transaction to be part of a different block, it will resubmit the proof-of-proof transaction. The WAIT and CONFIRM may take a while. Other steps should be fast. Once the PoP Miner is done, there is nothing more for it to do, check HowTo_run_PoP_Miner#viewrecentrewards to see about rewards. CONFIRM maybe several hours Waiting and listening for new Bitcoin blocks and transaction to confirm 20 times. Handles resubmission of PoP transaction to NodeCore if the Bitcoin blockchain should fork and previous block is no longer in the main branch. Note the the PoP Id (2aaef35f) given to each step. IMPORTANT! Bitcoin fee configuration changes from Fee per byte to Fee per kilobyte. The configuration property in the nc-pop.properties file has changed from bitcoin.fee.perbyte to bitcoin.fee.perkb. The configuration value should be 1000 times the previous per byte fee (Bitcoin 1 KB = 1000 Bytes). The rationale for this decision is that if we assume a normal PoP transaction has a size of ~285 bytes, a +1 increase in the fee per byte results in a 285 Satoshi increase in the final fee (+1 satoshi per byte * 285 bytes). Whereas a +1 increase in the fee per kilobyte results in a "0.285 Satoshi" increase in the final fee (+1 satoshi per kb * 0.285 kb). The net effect is a much finer granularity of control over the final fee. The minimum transaction fee per kb of 1000 Satoshis / KB can be disabled by setting the configuration value bitcoin.minrelayfee.enabled=false. This should be used with extreme caution as it is possible transactions below this threshold are ignored by the Bitcoin network. The "change" address used in a PoP transaction will now be reused. Given the high volume of transactions we've seen from PoP miners, importing wallets was becoming prohibitive due to the large number of items (address keys) present in the filter. Proof-of-proof transactions now take place on the Bitcoin MainNet and therefore spend BTC from your PoP miner's wallet. Each set of 20 contains just one Round 4 block, the last block, and is known as a "keystone". These properties can be set in the ncpop.properties file (in bin folder, located next to nodecore-pop.bat). If this file does not exist, it will be created the first time the miner is run. These can also be seen from running the "listconfig" command, and set with the "setconfig" command. WARNING: It is not recommended to configure both the pop.cron.schedule and the auto.mine.roundN properties as it can result in too many unconfirmed transactions chained together. pop.cron.schedule=0 0/30 * * * ? bitcoin-pop-testnet.wallet --> Bitcoin wallet, this contains your BTC! Does the PoP Miner require BTC or tBTC? Previously the TestNet PoP Miner required tBTC (testnet BTC) during the "Mining Sunrise" phase. After VBK MainNet launch, the VBK TestNet PoP Miner will again use BTC TestNet (tBTC), and the VBK MainNet PoP Miner will use BTC. How can I see my PoP rewards? Do I need to run a full Bitcoin node? No. The PoP Miner uses the bitcoinj library to embed a lightweight Bitcoin wallet (and SPV client), such that one does NOT need to run a full Bitcoin node. Does the Bitcoin I send to my PoP Wallet need to be confirmed? Yes. When funding your PoP wallet with "outside" funds, the transaction will need to confirm. During the course of normal PoP mining, the transactions created by the embedded wallet are considered trusted and therefore the wallet is allowed to create subsequent transactions that spend the pending UTXO. How do I set the BTC transaction fee? For "what should the BTC fee be", check: PoP_Miner_Rewards#What_should_the_tBTC_Tx_fee_be.3F. This section explains how to set the fee. Note: Make sure to also set 'bitcoin.fee.max'. This is the absolute maximum you're willing to allow the final transaction fee to be. An average transaction may be around 300 bytes (or, 0.3 KB), so, generally the configured maximum should be at least (0.3 KB x bitcoin.fee.perkb). How to auto-mine every Nth round? Note if you wanted different fees for different rounds, you could have multiple miners run. Miner A could run rounds 1-3 at Fee X, Miner B could run round 4 at fee Y. Note, it is advised to not use this and the cron expression - pick one or the other. Can I run multiple PoP Miners? Yes. Each instance of the miner will require its own unique wallet file (bitcoin-pop.wallet). Do not clone wallet files between instances. The best way to accomplish this is to make copies of the nodecore-pop folder before launching the miner, so that as each new instance is started, it will create a unique wallet file and download the appropriate SPV chain data. As there is an initial download of Bitcoin blocks, it is also recommended to spin up each new instance of the miner only after the previous completes its download. Can I import a previous BTC wallet? This will carry over the BTC balance. PoP wallet does not contain sufficient funds Send Bitcoins to your PoP BTC wallet address. Run commands showbitcoinbalance (it should be greater than zero), and sendbitcointoaddress. 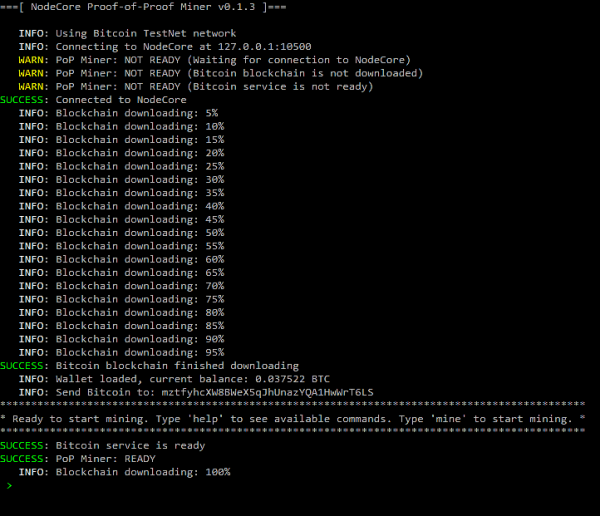 Bitcoin blockchain is not downloaded Ensure the ncpop.properties file has a line for bitcoin.network=testnet, and wait for the blockchain to download. There should be a message like "Blockchain downloading: 95%". Bitcoin service is not ready Check the other warnings. There should be a message like "SUCCESS: Bitcoin service is ready". For mainnet, acquire Bitcoin via normal means. For testnet, use a faucet to get test bitcoin. You can find a list of popular Bitcoin testnet faucets here: https://en.bitcoin.it/wiki/Testnet#Faucets. ERROR: Mining operation action took longer than expected. Operation can be resubmitted. PoP Transaction must complete within a certain period of time to remain relevant, and hence it times out. For example, if there's an abnormally high amount of context headers, that may cause a timeout. Why does the BTC address change each time I run the showAddress command? This kind of error implies that NodeCore is not ready. Can you run NC_CLI getinfo? Yes --> Then try to repeat the PoP miner operation. This page was last edited on 24 January 2019, at 11:19.